The Voice-Over Recording Room contains controls for recording a narration from a microphone while watching a preview of your video production. When you capture your narration, the audio track is automatically synchronized with the video portion. 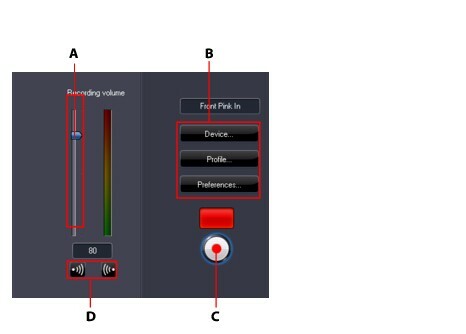 select Device to select your audio device and input. select Profile to set up the audio quality. select Preferences to set a recording time limit or 3 second delay before recording begins to ensure you are ready to record. You can also set auto fade ins and outs. click to add a fade-in effect or to add a fade-out effect. click to begin recording. Record your voice-over as you watch the video in the preview window. click to stop recording.